The origins of this palace aren’t clear, but it has always been associated with nobility. Once known as the Palace of Benavides and later as the Piedras Altas palace, it was home to the governor of Ávila and later a summer residence of the Marquis de Benavides. It was said that the palace once housed 35,000 books, 25 manuscripts, and 800 ancient books. Parking at the parador is limited. Being located right on the square, it can be noisy in the evenings. The best rooms are those that have a view of the garden and wall. Ávila is well situated for excursions to Segovia, Salamanca, and El Escorial. Ávila is 115 km northwest of Madrid on N-501. Trains leave from Madrid’s Atocha station and take about 2 hours. Buses make the same trip. 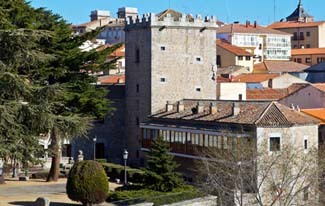 The parador is on the north side of town along the wall. Look for signposts. Few cities in the world attract visitors with their walls, but Ávila is one that does. It is encircled by a magnificent 11th-century wall that is reinforced with 88 semicircular towers, 2500 merlons, and 8 gateways. When the sun shines on the battlements and towers, the stones glow in golden tones. The parador adjoins this impressive wall. The parador was rebuilt about 70 years ago using as much of the old stone, timbers, and pillars as possible. The main stairway is original. Inside a small courtyard is surrounded by old columns and doorways leading to the public rooms, which are decorated in greens and yellows and in a style suggestive of the city’s medieval origins. Wood beams run throughout the palace. Guest rooms in the square tower face the gardens and are part of the famous wall; they are decorated in shades of cream. Rooms are booked early for summer by residents of Madrid who come here to take advantage of Ávila’s cool climate. The dining room looks onto a terraced garden and features Castilian dishes. The walls of Ávila have been declared a Spanish National Monument.